Quality Air Heating and Air Conditioning > Articles > Heating > Columbus Heating Question: What Is a Downflow vs. an Upflow Furnace? Columbus Heating Question: What Is a Downflow vs. an Upflow Furnace? 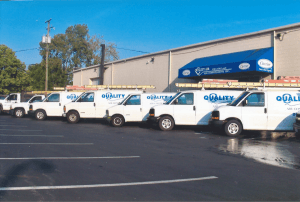 When you go looking to buy a furnace in Columbus, you may well be surprised by how many different elements go into making a good purchasing decision. There are simply so many different kinds of furnaces available now and they each are more appropriate for certain situations. That means that finding the one that’s right for you is less about finding the one best unit than it is about finding the one that is the best match for your particular circumstances. This applies to the type of fuel the furnace uses, its energy efficiency, and whether it’s an upflow furnace or a downflow furnace. Energy efficiency and fuel types are probably things that you’re more or less familiar with. But what are we talking about when we classify a furnace as an upflow or downflow model? Well, it’s pretty much what it sounds like. These terms refer to the direction the air flows as it is taken in and heated by the furnace. So in an upflow furnace, the cool air is taken in at the bottom, warmed, and then expelled at the top. A downflow furnace, on the other hand, takes in cool air at the top and expels heated air at the bottom. While this is all very exciting, it may still not be obvious what impact this will have on your decision about what type of furnace to buy. The main thing you’ll have to think about when you’re deciding between an upflow and a downflow furnace is where the furnace will be placed in your house. An upflow furnace is generally installed in the basement so that the heated air is directed towards the parts of the house you want cooled and so that the furnace can be appropriately vented outside of the house. On the other hand, a downflow furnace would be installed in your attic for the same reasons. So where you want to have the furnace installed is probably the biggest thing to take into account as you’re comparing these two types of equipment. Of course, whether you pick an upflow or a downflow furnace, you’ll still have to select the appropriate AFUE, size and fuel source to best meet your needs. But making the choice between upflow and downflow can at least make it easier to narrow down your options. For more information about heating installation, give Columbus HVAC contractor Quality Air Heating and Air Conditioning a call!